The Clock Shop01545 571240work ShopClock And Barometer Shop. Providing the complete clock and barometer quality service and advice. Repairs and restoration, free quotes given. My shop also has a wide selection of quality clocks and barometers for sale. So come in and browse, have a chat. Clock And Barometer Shop. Providing the complete clock and barometer quality service and advice. Repairs and restoration, free quotes given. 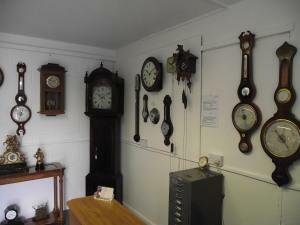 My shop also has a wide selection of quality clocks and barometers for sale. So come in and browse, have a chat.